On August 18, in an unexpected move, the Narendra Modi government called off the foreign secretary (FS)-level talks scheduled to be held in Islamabad on August 25. The sudden twist of events left most surprised, including the ministry of external affairs (MEA). The reason cited was the meeting between the Hurriyat Conference, represented by Mirwaiz Umar Farooq, Syed Ali Shah Geelani, Shabir Ahmad Shah and Yasin Malik, and the high commissioner of Pakistan to India, Abdul Basit. New Delhi had indicated its displeasure at Basit’s invitation to the Hurriyat leaders. Pakistan’s foreign policy. Apart from employing back channels in a dialogue, in the past India and Pakistan have at times tried to keep the contentious Kashmir issue separate from other aspects of its bilateral relations. Whatever little strides have been made in normalising relations between the two countries are due to this sagacity. Though Pakistan’s official discourse immediately after partition was that the only accepted solution to Kashmir was a plebiscite, which was backed by an UNSC resolution, by 2007 it had agreed to drop all references to a plebiscite. However, in May 2014 its army chief, Raheel Sharif, called Kashmir Pakistan’s “jugular vein” and said that the issue should be resolved by UNSC resolutions. New Delhi’s official stance is that Kashmir is an integral part of India and the only matter of dispute is Pakistan-occupied Kashmir (PoK). The cancellation of talks between FS Sujatha Singh and her Pakistani counterpart, Aizaz Ahmed Chaudhry, by the Modi regime, is not an aberration but a systematic attempt to break away from precedents and reconfigure a tough stance on the Kashmir issue, as also make the issue a strictly bilateral matter. As part of efforts to end international interference on J&K, the Modi government withdrew on July 8 the facility of the official residence of the United Nations military observers group in India and Pakistan (UNMOGIP), provided by the Indian government which it had occupied since 1949. However, the cancellation of talks might ironically encourage international interference, if it is perceived that India is abandoning a peace dialogue. It has also given a renewed thematic vigour to the separatists who are crying foul that their voices are being stifled. Moreover, in the forthcoming Jammu and Kashmir (J&K) assembly elections, the BJP is banking on consolidating the Hindu vote bank in Jammu since the party’s chances are bleak in Kashmir. After taking charge, prime minister Modi has already visited Jammu and Ladakh once each, and has raised the Pakistan issue during his visits. Taking a hard-line on the Kashmir issue may help divide the votes on communal lines. Pakistan has violated the ceasefire agreement 23 times in August alone. According to reports, there have been 90 infiltration attempts into India this year. However, India will have to continue dialogue with Pakistan notwithstanding the unresolved status of the Kashmir issue and the LoC (the de facto border dividing Kashmir between India and Pakistan) incursions, given the complex dynamics of the Pakistan polity, if the regime is serious, as it says it is, about a more stable regional neighbourhood. 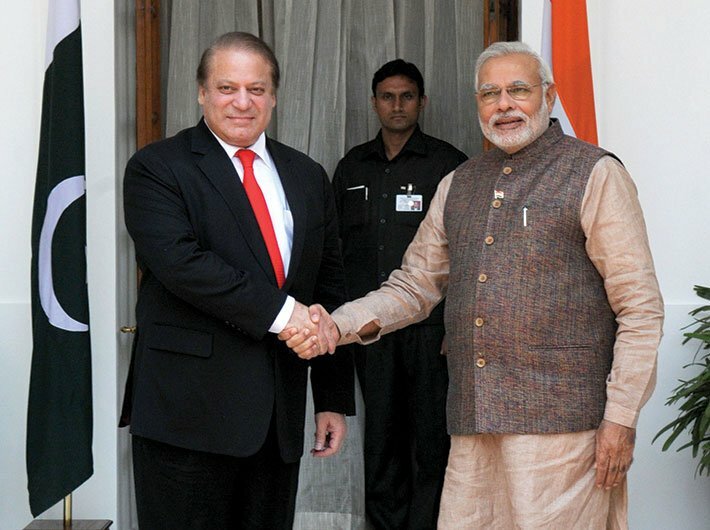 Pakistan prime minister Sharif has made genuine attempts for rapprochement with India. He did not invoke anti-India sloganeering during his electoral campaigns. It is also important to note that he did not meet the Hurriyat when he had come to New Delhi to attend Modi’s swearing-in ceremony, for which he faced considerable flak at home. However, Sharif’s position at the moment is somewhat fragile at home. Imran Khan, the cricketer-turned-politician and head of Pakistan Tehrik-e-Insaaf (PTI), and cleric Tahir-ul-Qadri have launched an aggressive drive demanding Sharif’s resignation. Sharif is deeply unhappy with the army and the inter-services intelligence (ISI), while the army views Sharif as a troublemaker. Sharif, who is soft on India, faces much embarrassment with New Delhi’s decision to cancel talks. He may now be forced to take an anti-India stand to please his domestic constituency. The difficult situation between India and Pakistan has been complicated ad infinitum by Pakistan’s national security institutions like the military and the ISI. The situation in Pakistan can be aptly described by a quote of the Prussian minister-president Otto von Bismarck: “Whereas some states possess an army, the Prussian army possesses a state.” Not only does the Pakistani military establishment, particularly the army, control civilian life but it has also made deep inroads into the Pakistani economy. In her book Military Inc., Ayesha Siddiqa describes the army as possessing not just security-related businesses, but also hotels, shopping malls, insurance companies, banks, farms and an airline. Siddiqa has coined the term ‘Milbus’ to refer to “military capital that is used for the personal benefit of the military fraternity, especially the officer cadre, but is neither recorded nor part of the defense budget.” Pension five times the size of civilian pension and post-retirement jobs, for instance, are given to make the military services attractive. The strong duality in Pakistan’s foreign policy, thus, is a structural problem of misalignment between Islamabad and Rawalpindi. For instance, Benazir Bhutto’s first government (1988-1990), along with her Indian counterpart Rajiv Gandhi’s administration, established confidence-building measures on security matters and of terminating support to Sikh insurgents in Indian Punjab for normalising relations with India. However, the military launched a parallel policy of supporting Pakistan-based, Kashmir-oriented militants in J&K. Bhutto was ousted at the behest of the military by the president in 1990 for her overtures to India. Similarly, Sharif’s efforts for a peaceful relation with India were scuttled by the military through its incursions across the LoC in Kargil in 1999. Again, in 2004, Musharraf and Vajpayee’s attempts to peacefully resolve all contentious issues, including Kashmir, were set back by the Pakistani military calculations. Sharif reiterated in 2012 that he felt deeply betrayed by Kargil and would like to resume where things were left off in the 1990s. The military’s Kashmir policy continues to wage a proxy war in Kashmir through Pakistan-based groups such as Lashkar-e-Tayyaba (LeT) and Jaish-e-Mohammad. Trade normalisation was one of the important issues discussed during the Sharif-Modi meet in New Delhi in May. A core issue slated for the August 25 discussion was that of Pakistan granting India a most favoured nation (MFN) status, which India has already granted Pakistan in 1996. Though Islamabad agreed to the MFN status in September 2012, it is yet to implement it, purportedly due to pressure from Rawalpindi. It is in the process of negotiating a more acceptable (to the hardliners) nomenclature of non-discriminatory market access. However, it still has to use the MFN nomenclature when notifying the World Trade Organisation. India’s total bilateral trade with Pakistan is $2,701 million which constitutes only 0.35 percent of India’s total trade, notwithstanding the MFN status given to Pakistan. This is much less than an estimated potential of $40 billion. Moreover, in January 2014, the Pakistani cabinet agreed to a memorandum of understanding (MoU) for buying electricity from India. If Pakistan buys around 1,200 megawatt power from India, it would be more than the amount currently bought from Iran and the projected amount of electricity to be bought from Tajikistan. Diplomats pessimistic of commercial diplomacy assuaging the strained relation in any substantial way must come to terms with the fact that in such a complex scenario, it is of crucial importance to keep the doors open encouraging every little nudge that might make the peace process stronger. The fact remains that our neighbours cannot be wished away. Diplomacy must acknowledge the political realities of the country it is dealing with and devise strategies accordingly to weave in fractured discontinuities. Waiting for Rawalpindi and Islamabad to talk in one voice might be a far stretch. In the meanwhile, small but steady steps are the lifeline of a drowning peace process which has proved heavily detrimental to both countries. MEA termed the FS-level meet in Islamabad as “talks about talks”, pointing towards a probable Modi-Sharif meeting on the sidelines of the UNGA summit this month. The format of the composite dialogue process (an eight-issues basket including Kashmir) needs to be brought to the table. Though this “talks about talks” may have been cancelled, it is crucial that talks between the two leaders take place during the UNGA summit. The civilian leadership will benefit majorly from such diplomatic and political momentum, making it difficult for spoilers to disrupt the normalisation process further.